UPDATE III: "The basics are straightforward and unambiguous: The Congressional Budget Office yesterday reported that the federal budget deficit will fall to 2.8 percent of GDP this year, almost one-third below what it was in 2013. As a percent of GDP, not only will that be the lowest deficit since 2007, the drop from 9.8 percent in 2009 to 2.8 percent in 2014 is the largest five-year reduction in federal red ink since the end of World War 2, that is, in almost 70 years. Read Forbes, Why No One Is Celebrating The Much-Lower Deficit. So tell me again, which party is the real big spender? UPDATE: "[I]f you want to see government responding to economic hard times with the “tax and spend” policies conservatives always denounce, you should look to the Reagan era — not the Obama years. . .
As many economists have pointed out, America is currently suffering from a classic case of debt deflation: all across the economy people are trying to pay down debt by slashing spending, but, in so doing, they are causing a depression that makes their debt problems even worse. This is exactly the situation in which government spending should temporarily rise to offset the slump in private spending and give the private sector time to repair its finances. Yet that’s not happening. The point, then, is that we’d be in much better shape if we were following Reagan-style Keynesianism. 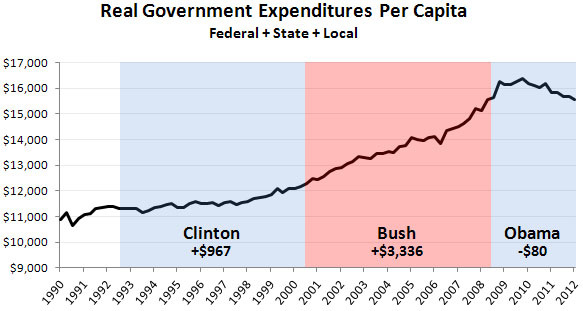 Reagan may have preached small government, but in practice he presided over a lot of spending growth — and right now that’s exactly what America needs." Read The New York Times, Reagan Was a Keynesian. "Of all the falsehoods told about President Barack Obama, the biggest whopper is the one about his reckless spending spree. 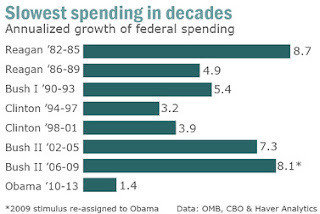 Even hapless Herbert Hoover managed to increase spending more than Obama has. 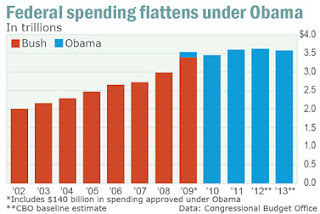 . .
Over Obama’s four budget years, federal spending is on track to rise from $3.52 trillion to $3.58 trillion, an annualized increase of just 0.4%."